mlmiller1 - Brian Enos's Forums... Maku mozo! I shot glocks in uspsa limited major for 16 or 17 years. Great tools but let me say when I bought an sti, it sure felt good! Ryobi is fine. Glock is fine. Stepping up to a higher level gun in fit & build quality was a nice move though & I am glad I did. 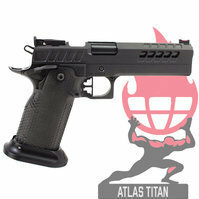 Im not sure you can call an sti a custom gun at least not directly purchased from sti. They are nice guns but not customs. They are sort of hand built but not to a customers specifications but to the particular model specs they are building that day. 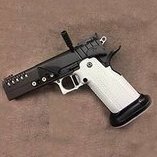 Now an sti parts built or gun modified & sold by any number of the gunsmiths people talk about on here is closer to a custom gun. Perhaps the gunsmith works with you on what you want on or in the gun (bedell)or perhaps they just do things to a stock sti they think should be done then resell it (brazos) Either way its still an sti. I like sti, dont get me wrong, I have 2, but both have had things done to them. Still neither is a custom gun. Infinity is closer to a custom gun sort of like ordering a new car. You pick options off a list & have svi build their gun with these options. There is more handwork, more care & subjectively better parts put in svi guns than sti. A true custom gun has the builder working with the customer. You work together deciding many of the options you want or need in this gun. Hand size, trigger length & pull, recoil impulse, sight choices, weight, balance forward & rearward on gun, & of course appearance of gun. The difference between an off shelf sti & a true custom gun can be dramatic. Problem is does a new shooter know what they need? Not really. Also will you truly utilize & appreciate the difference? Least custom to most: Off shelf sti Modified or tuned sti, dawson or brazos Smith built gun using some sti parts, bedell Option chosen infinity off website Smith built gun with svi parts, no builder name for certain here but heard limcat uses svi parts...not sure Full custom built gun with each & every possibility( within that gunsmiths parameters) discussed & decided upon. Atlas will do this along with akai I believe plus there are others. There is no shortage of good gun builders that will build you a real custom gun. Sti is about the least custom (still nice guns) on up the food chain. Ask yourself if the tools you work with to make a living matter to you...computer guys...is basic keyboard just fine & dandy or do you wish you could have 1 built to your liking? Me I work with hand tools. I like wood handle hammers. Ive got 3 hammers Ive had for 30 years plus. I put new handles in them the other day & I am still shaving & scraping adjusting them to fit me. If you can appreciate a tool(gun) built to your specs, shop out a custom, if not, buy something less custom, less $$$$, less time & go on. If you want to impress your friends then have someone do something nifty to it to make you feel its made for you personally...trigger job or fancy finish.. steel grips are big deal now. Then you can be all proud of your custom gun...hahaha. If you shoot a glock or whatever you shoot( which I did for 17 years), could you close your eyes, have someone put a glock in your hands & still w your eyes closed know if this was your gun or not? If not, dont waste your money on a full custom... if you know your gun by the feel by the weight by whatever makes it different & special to you, then a custom might be in your future. You had a draw to first shot time of .40? Gosh almighty! Those are Bob Munden speeds! Just curious but what caliber & how many rounds they hold like they are? You can shoot DAO in limited. Look at all the glocks & springfield xd guns. There is possibly a disadvantage with the trigger pull being dao but plenty of matches are won with them. At buds it is $1833 today & doesnt come with a dot or big mags.... also doesnt say who's mags will fit. Why go titanium comp but hybrid barrel? Im a limited shooter so this is my viewpoint. Not only does it take more effort to move heavier gun, it takes more effort to stop the heavier gun. Plus the further out on the gun the weight is, the more leverage that weight applies to your grip both starting & stopping movement. 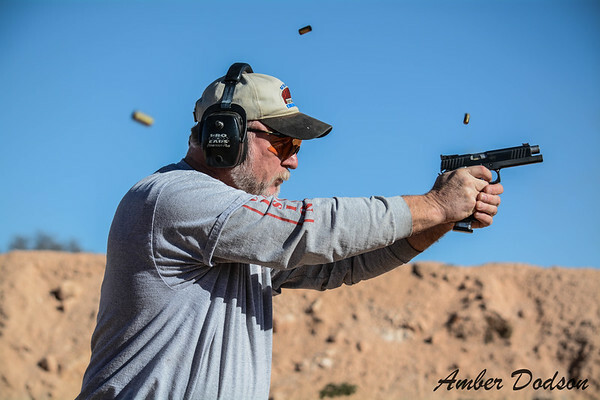 However transitions are only half the consideration.... recoil for splits is when you want more weight further away from your grip to reduce muzzle rise.... Oh boy, now what do you do? You find the compromise that works best for you. Give up some here to gain some there... There is 1 more thing to think about on weight distribution. Slide closing. 3 years ago after shooting glocks exclusively for 15 or 16 years I went to an sti edge stock gun. Definitely an adjustment. I shot the stock edge for a few months when I bought a 2nd used edge for a backup. Turns out this gun has a very lightened top end. I ran 1 mag thru it & my stock edge became my backup. Lol. Felt better & I shot better w the light slide. Well couple months ago the light slide suffered a fatal fracture. Lightened too much. I went back to the stock edge. I went from a lot of 2A to A, low C or A, low D. I thought I was seeing my sights on 2nd shots but I was at least partly just feeling it I guess. Heavy slide slamming shut driving muzzle down as I was breaking 2nd shot. Ok poor operator skills I know but it showed me lighter slide is a better fit for me. I am now about to have stock edge slide lightened & a new slide lightened & fit on the other gun. My compromise is a lighter slide. You have to determine yours.